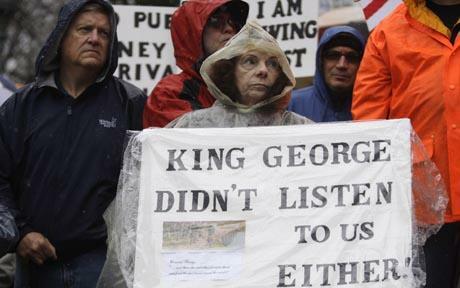 The Tea Party Movement has caught the attention of some of our cou sins in the UK. The UK Telegraph, in a brief article today, announced the official launch of the British Tea Party Movement on Saturday, February 27th in the Brighton home of Daniel Hannon, journalist and EU Parliament Member. And like our movement here in the US, this grassroots gathering will be a small cadre of concerned citizens who feel their country has been heading in the wrong direction for too many years and needs a radical shift in perspective. The comments that accompany the Telegraph article are an interesting read. There are the usual snotty scorners and anti-American rants but many if not most of the comments are supportive of the movement and fed-up with the high taxing intrusive socialism that is the daily life of Britain. This entry was posted in Political/Social and tagged british tea party, telegraph. Bookmark the permalink.